The percentage of island countries that are democratic is higher than that of continental countries. Historically they have been less prone to political instability than their continental counterparts. Island countries have often been the basis of maritime conquest and historical rivalry between other countries. Island countries are more susceptible to attack by large, continental countries due to their size and dependence on sea and air lines of communication. Many island countries are also vulnerable to predation by mercenaries and other foreign invaders, although their isolation also makes them a difficult target. Many island countries rely heavily on fish for their main supply of food. Some are turning to renewable energy—such as wind power, hydropower, geothermal power and biodiesel from copra oil—to defend against potential rises in oil prices. Some island countries are more affected than other countries by climate change, which produces problems such as reduced land use, water scarcity and sometimes even resettlement issues. Some low-lying island countries are slowly being submerged by the rising water levels of the Pacific Ocean. Climate change also impacts island countries by causing natural disasters such as tropical cyclones, hurricanes, flash floods and drought. In 2011, the Center for Climate Change Law (CCCL) held a conference attended by 272 registrants from 39 island nations titled Legal Issues for Threatened Island Nations. Many island countries rely heavily on imports and are greatly affected by changes in the global economy. Due to the nature of island countries their economies are often characterised by being smaller, relatively isolated from world trade and economy, more vulnerable to shipping costs, and more likely to suffer environmental damage to infrastructure; exceptions include Japan and the United Kingdom. The dominant industry for many island countries is tourism. Island countries are typically small with low populations, although some, like Indonesia and Japan are notable exceptions. 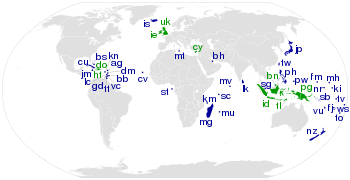 Some island countries are centred on one or two major islands, such as the United Kingdom, Trinidad and Tobago, New Zealand, Cuba, Bahrain, Singapore, Iceland, Malta, and Taiwan. Others are spread out over hundreds or thousands of smaller islands, such as Indonesia, the Philippines, The Bahamas, Seychelles, and the Maldives. Some island countries share one or more of their islands with other countries, such as the United Kingdom and the Republic of Ireland; Haiti and the Dominican Republic; and Indonesia, which shares islands with Papua New Guinea, Brunei, East Timor, and Malaysia. Bahrain, Singapore and the United Kingdom have fixed links such as bridges and tunnels to the continental landmass: Bahrain is linked to Saudi Arabia by the King Fahd Causeway, Singapore to Malaysia by the Johor–Singapore Causeway and Second Link, and the United Kingdom has a railway connection to France through the Channel Tunnel. Geographically, the country of Australia is considered a continental landmass rather than an island, covering the largest landmass of the Australian continent. In the past, however, it was considered an island country for tourism purposes (among others) and is sometimes referred to as such. ^ a b Ott, Dan (1996). Small is Democratic. Routledge. p. 128. ISBN 0-8153-3910-0. Retrieved March 23, 2019. ^ Chasle, Raymond (1 Oct 1986). "The quest for identity. (island countries)". UNESCO Courier. Retrieved 2009-02-01. ^ Perry, Walt L.; Robert W. Button; Jerome Bracken; Thomas Sullivan; Rand Corporation; United States Navy; Jonathan Mitchell (2002). Measures of Effectiveness for the Information-age Navy. Rand Corporation. p. 7. ISBN 0-8330-3139-2. ^ WREN, CHRISTOPHER S. (December 9, 1989). "Mercenary Holding Island Nation Seeks Deal". New York Times. Retrieved 2009-02-01. ^ "Many of the world's poorest people depend on fish". Food and Agriculture Organization of the United Nations. 2005-06-07. Retrieved 2017-09-30. ^ Xingwei, Huang (2008-10-17). "Pacific Islands countries switch to renewable energy source due to increasing fuel prices". Archived from the original on 2015-04-02. Retrieved 2009-02-01. ^ "Leader of disappearing island nation says climate change an issue of survival, not economics". June 5, 2008. Retrieved 2009-02-01. ^ "FAO: Climate change threatens food security of Pacific island countries". December 2, 2008. Retrieved 2009-02-01. ^ "Threatened Island Nations Conference - The Earth Institute - Columbia University". www.earth.columbia.edu. Retrieved 19 April 2018. ^ "Global economic crisis a concern for Pacific island countries". 2008-10-28. Retrieved 2009-02-01. ^ "WTO/FORSEC Trade Policy Course for Pacific island countries". 9 March 2001. Retrieved 2009-02-01. ^ "NZ calls for global solutions to problems faced by small island nations". 2005-01-18. Archived from the original on 2012-10-24. Retrieved 2009-02-01. ^ Garg, Sarika. "U.N. ambassador gives keynote". Retrieved 2017-09-05. ^ "China enlists Pacific island countries as tourist destinations, XINHUA". The America's Intelligence Wire. 10 August 2004. Retrieved 1 February 2009. ^ "Wen pledges new aid to Pacific countries". International Herald Tribune. April 5, 2006. Retrieved 2013-08-21. ^ "Australian Naval Defence". The Brisbane Courier. 24 July 1897. Retrieved 2009-01-31. ^ "China, Pacific island countries discuss cooperation at forum meeting". Retrieved 2009-02-01.